John Dimase is a welcome presence on today's music scene. He is praised by peers and critics for his ability to move an audience through melody. Born and raised in Albany, New York, John started taking piano lessons at the age of seven and picked up the trumpet just a few years later. Growing up in a family that loved to listen to jazz, John decided to follow his older brother's footsteps and join his high school jazz band. 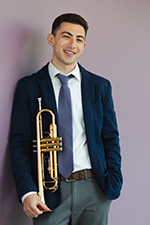 Quickly learning the ways of the music, John started to make a name for himself joining groups such as the Empire State Youth Jazz Orchestra, New York's All-State Jazz Ensemble, the NAfME All-Eastern Jazz Ensemble, the Skidmore Jazz Institute and Jazz at Lincoln Center's Summer Jazz Academy under the direction of Wynton Marsalis. John has had the pleasure of learning from and playing with some of the greatest musicians of our time including Dylan Canterbury, Jimmy Greene, Michael Rodriguez, Joe Magnarelli, Mike Natale, Tim Warfield, John Swana, Marcus Printup, Sean Jones, Jon Faddis, Antonio Hart, Terell Stafford, and Wynton Marsalis among others. 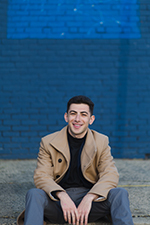 John currently lives in Philadelphia, Pennsylvania and is in his senior year of Temple University's Jazz Studies program under the direction of Terell Stafford. He frequently returns to the capital region to listen and play with local musicians. He is a member of Albany's Hudson River Jazz Quartet.